Pulling in truly accurate range measurements at distances exceeding half-a-mile is now a reality with Nikon''''s'' Monarch Gold Laser 1200 compact rangefinder. Boasting an honest 1200 yard ranging capability, the Monarch Gold not only puts "can do" confidence into your long range vocabulary, but it does it with a host of advanced technology: like Nikon''''s'' original digital measurement process that provides lightning-fast measurements with pinpoint, 1/2-yard precision up to 550 yards and consistent one-yard accurate readings out to 1,200 yards, or Nikon''''s'' revolutionary Tru-Target (TT) Ranging System — with First Target Priority and Distant Target Priority modes. This 9.8 ounce wonder also has a selectable backlighting feature in the bright LCD display, scanning capability, eyeglass friendly 7-power multicoated optics with focusing diopter, a 34mm laser pulse receiver and, like all Nikon Monarch optics, it is guaranteed waterproof and fogproof. Tripod adaptable. Includes CR2 Lithium battery. 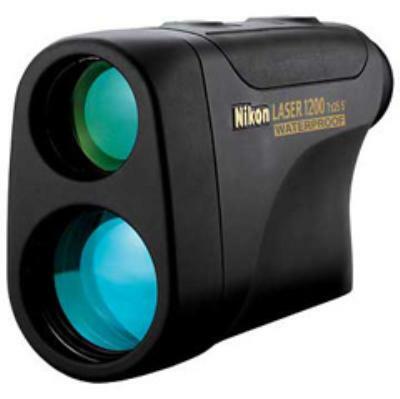 Click the button below to add the Nikon Laser 1200 Monarch Gold Rangefinder to your wish list.